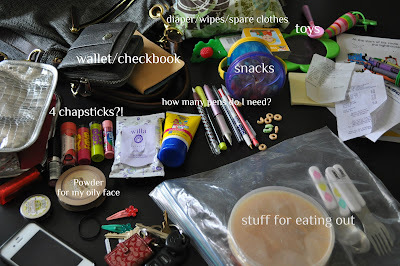 I decided to clean out my purse this morning, I dumped it all out onto the dining room table. Some Thomas stickers/coloring pages which I ripped out of the kids activity book (we were planning on eating out yesterday, but hubby had to work late, so plans changed). 2 lipsticks (for when we went out and I threw them in my purse to touch up after dinner (did I actually have time to use them? NOPE. A ziplock bag of 2 plastic plates (with lids) and kid utensils (for eating out) The kids always split a kids meal. I don't always carry this, only when we go out to eat. Since we didn't end up going out last night, I took the bag out and left it in the tupperware drawer. My hand sanitizer and little first aid kit are no where to be seen. If you have kids, you know what I mean. You are constantly pulling things out of your purse to keep the kids quite. When Toys don't work anymore, things like first aid kits are a miracle worker. LOL. This made me chuckle. It's a great idea. I am totally doing this. Thanks for the inspiration! I'll link you when I get it posted.